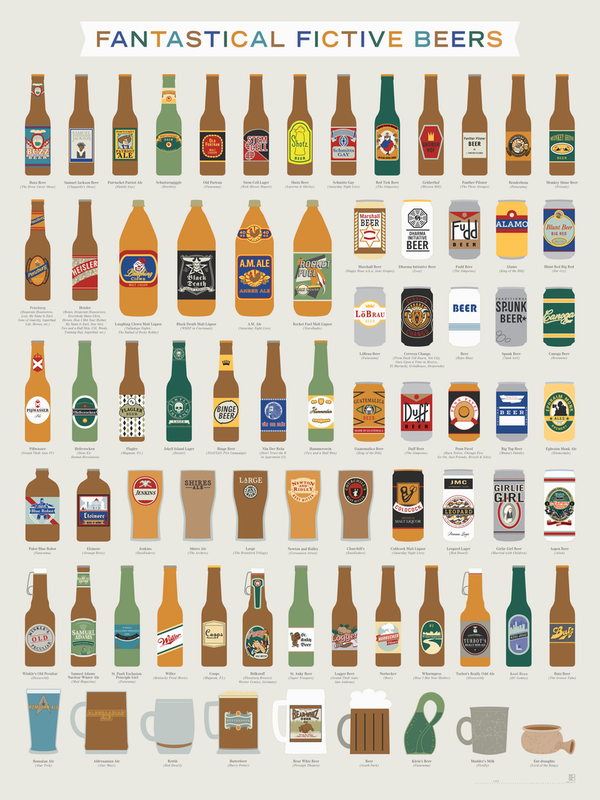 Not content with mapping out over 500 actual beers, Pop Chart Lab has now cataloged 71 fictitious beers and beer-like substances from popular media. Everyone's heard of Butterbeer, but did you know about Heisler—an in-house fake beer from prop supplier Independent Studio Services—has been used in Desperate Housewives, How I Met Your Mother, New Girl, Two and a Half Man, CSI, Weeds, Training Day, and Superbad, among others? Space was obviously limited, so while Duff made the cut, you won't find Lady Duff, Henry K. Duff's Private Reserve, or Tartar Control Duff anywhere, so you can stop looking. Here's a high-res version. Click to enlarge.